“What’s that bib you’re wearing?” “This,” the wearer says, “is my rakusu.” Some of us are humorous, some shy or very reverent, some proud or patient, or all of those things—as we show others the many finely stitched panels of the rakusu, our “Buddha bib.” Usually admiration follows, accompanied by an examination of the back of this miniature representation of the robe that Shakyamuni wore. Here the person’s teacher has done calligraphy, perhaps some art as well, and has written the vow-taker’s Dharma name on the white silk facing. A poem may be there, or a koan (teaching challenge). 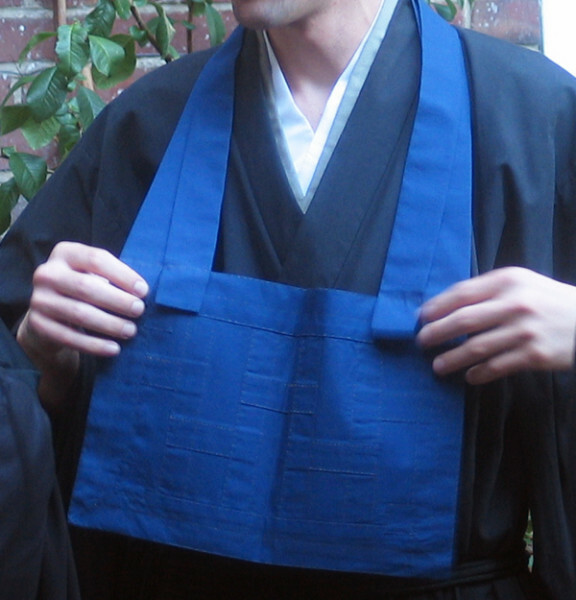 A student who enters the Soto Zen lineage of Shunryu Suzuki Roshi must undertake the remarkable endeavor of sewing a rakusu, which will be worn during zazen, practice discussions, lectures and other Dharma activities. Sewing begins with permission from the student’s teacher. Once complete, the work is surrendered to the teacher, to be bestowed on the student in a ceremony called Jukai. Anyone who has an established practice and would like to sew, but has not received permission, may discuss the matter with one of the Zen Center teachers, who are available for guidance and Dharma instruction leading to lay ordination. At first I used my conditional upbringing as an American man. Sewing? Really? . . . After the initial resistance, I really fell into the process. It was amazing to see my emotions play out in each row of stitching. Looking back at my stitches, I could tell . . . I learned that giving myself room and having patience makes for a clearer mind, allowing my heart and actions to feel more on the same wave length. Before, pushing through and efficiency were top priorities. The further and further I got along, there was increasing appreciation, wonderment, gratitude and satisfaction as I realized the significance and history of what was being sewn—this “robe of Buddha.” Wearing it . . . has truly changed my life. The second I put it on I was able to somatically experience myself in a different way. There is space for the person I am now and now and now . . . and now. I also have the ability to forgive myself more. Every day when I put on the rakusu I am reminded who I am allowed to be, who my teacher sees when I arrive, and the vow I made to all beings. For me the sewing of a rakusu was a lovely experience. I’ve not had a lot of experience sewing anything before—so it gave me a small container in which to experience frustration, impatience and discomfort—pricked fingers and an aching back were consistent companions. In the end, more than anything else, it gave me a chance to experience a supportive community, deep satisfaction in my own work and letting go of all the impatience and perfectionist thought. To practice acceptance of what is. My rakusu is me, imperfections and all—and that’s OK. A powerful teaching. 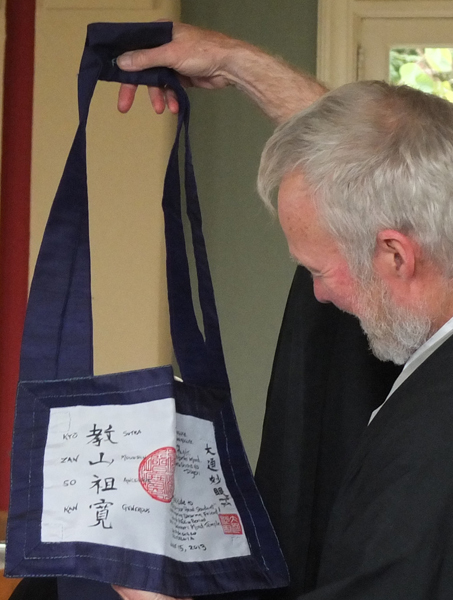 The Zen Center sewing teachers make rakusu sewing instructions available on the main website. These sewing instructions are intended to be used in conjunction with instruction from a qualified sewing teacher, as it is almost impossible to describe the construction of the rakusu just through words. The teachers do not recommend attempting to sew a rakusu solely by relying on these written instructions. Consultation includes discussion of appropriate fabric and thread, and the measuring, cutting, piecing and stitching. Strap measurements are tailored to the individual. The tradition of sewing that has been passed down to us includes various preferred methods, which are all valid. The sewing teacher helps with all these questions and technical difficulties. Sewing practice began at SFZC under the tutelage of Yoshida Roshi in 1970 and continued with Joshin-san from 1973 to 1975. Later, Mitsu Suzuki, the wife of Shunryu Suzuki Roshi, taught us how to make other monastic garments such as juban and hippari. 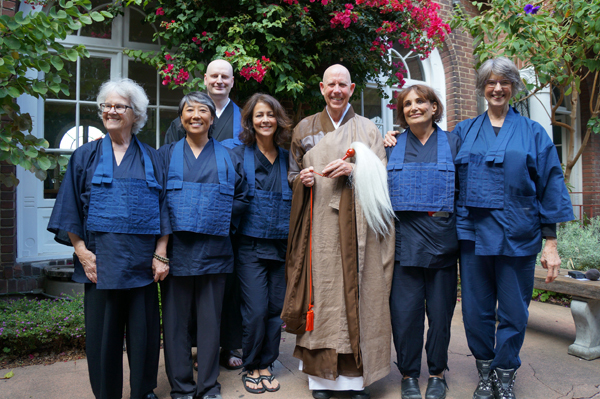 Zenkei Blanche Hartman has carried on the teaching of sewing Buddha’s Robe at SFZC from these teachers. Each sewing class begins with a brief service, and Buddha’s aid is invoked with each stitch (“Namu Kie Butsu”). It is a great adventure! 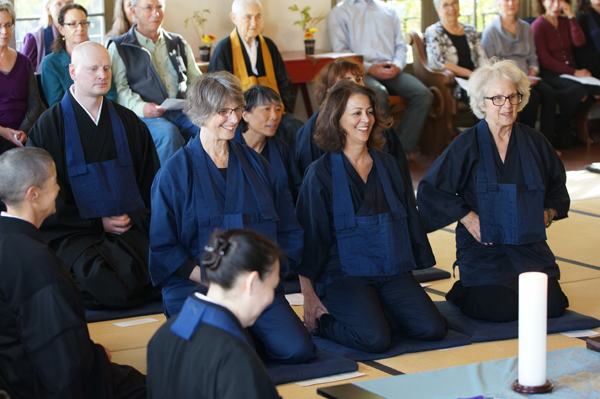 Dawn Moore, a long-time practitioner and volunteer at City Center, said, “The camaraderie of sewing and then wearing the rakusu is great, especially when sitting with the dying, or the sangha.” But Dawn travels a lot between the temple, her work and school. “Losing the rakusu is a worry, so it’s often left at home.” Losing a precious rakusu would mean beginning the sewing process again. Not that sewing is unrewarding in itself! 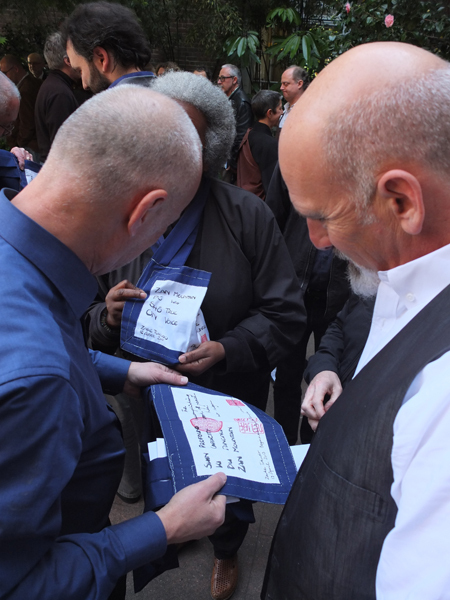 Many people continue with sewing on rakusus, rakusu envelopes, or items for newly ordaining priests, since Robes may also be sewn as gifts for others who have already received the Precepts. The dedicated practice of sewing is part of our lineage. It also connected me to my mom, who is still alive, Japanese, and enjoys sewing—especially needlepoint and Japanese embroidery. I received my rakusu from Tova [Green] and Linda Ruth [Cutts]. The poem says in Japanese, “Sitting, Standing, Walking, Lying down.” I consider my rakusu my cloak of compassion. It gives me strength, a reminder, and I have it with me during all my waking hours whether I’m wearing it or not. While appreciating the comments given above, it is important to remember that holding the precepts is hard work—life in the closer or the wider sanghas of this world is no bed of lotus petals. Among those interviewed for this article was one student whose remarks reflected day-to-day frustration. Still, the student wears the rakusu with commitment. What is never far from the high of taking the vows is the difficulty of keeping the Precepts and the disappointment of falling short, either in ourselves or in fellow sangha members. [They] include such vows as being satisfied with what one has, listening and speaking from the heart, speaking what one perceives to be the truth without blame or guilt, and unconditionally accepting what each moment has to offer. Together with saving all beings and entering all dharma gates, these give us a “map” for the Buddha Way, which we vow to take up, or “become,” when we receive Jukai.